For some of us this is the time of year we open the windows and have a nice breeze flowing through our home. When the windows are opened you hear everything, inside and out. But what if you are enjoying the day on your deck with friends and someone inside your home needs to clean up a quick mess, so they switch on the central vacuum system. To your surprise all you hear is the central vacuum system and realize it’s not as quiet as it used to be. This could mean your system is ready for an upgrade . Typically, units last for a good 20 years; that’s a long time. But like most technology an upgrade is needed from time to time to keep the system working at its peak performance. 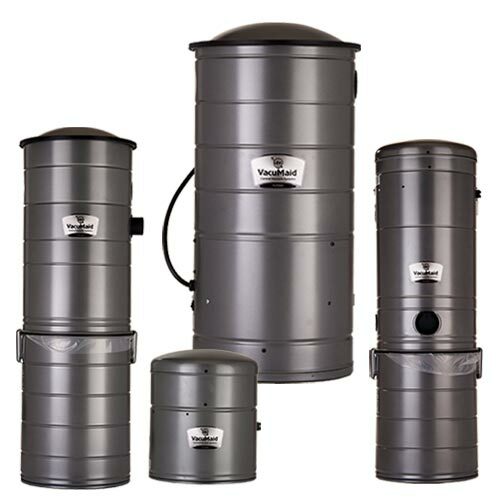 Vacu-Maid has a great line of central vacuum systems that are fantastic for upgrading and they have something for everyone. Vacu-Maid has 3 types of units: Cyclonic, Filtered, and Bagged . Cyclonic means that the dirt and debris swirls like a cyclone in the dirt canister separating the large debris from the smaller dust and dirt. The cyclone forces the larger debris to fall to the bottom of the dirt canister while the lighter dirt and dust is vented outside of the home. The dirt canister is equipped with a plastic liner that makes for easy empting. This Cyclonic technology features no filter to clog, and the cleaning power is 100% sustained. The Cyclonic units are available in 2 types. One piece or split canister power units. A one-piece unit is one canister spilt into three compartments: the first for the motor, the second for the separation of particles and debris, and the third for the dirt collection bag. The split canister is a unique design that allows you to have the power unit in one area, and the dirt canister in a separate area. This further reduces motor noise and places the dirt canister where it is easily accessible. This unit is also great for homeowners with pets. Most of the pet hair is collected in the bottom can and if any makes it way to the top screen it can easily be removed by wiping the screen. The Filtered unit means that it has a permanent filter made of Surf-Tex™ which resist bacteria, mold, and mildew growth. It also captures particles as small as .3 microns and has a dust retention of 97% efficiency. Just like the other units the debris is collected in the bottom canister that has a plastic liner for an easy cleanup. The Bagged unit has a paper filter and incorporates a two-layer disposable bag system which adds longer life, more strength and resistance to bursting, and also acts as an electrostatic barrier. The bags are very inexpensive and easy to dispose of, making maintenance simple. If you have questions, please contact our friendly experts at 1-800-533-3249 or visit our website www.qualityhomesystems.com. Don't forget to visit and like our FaceBook page.